SYNOPSIS: Rock Star, Artist, writer Reg Mombassa has influenced Australian culture for thirty years. From Mental As Anything to Mambo he's made two generations of people laugh, dance and wonder at the beauty of his creations. GOLDEN SANDALS is a journey into the world of Reg with his aliens, animals and Australian Jesus. It's an animated trip to the roots of what makes Reg tick. When you put on a pair of golden sandals the cares and worries of a fractious world drop away. You enter a parallel universe where ridiculousness prevails. 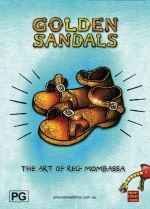 GOLDEN SANDALS is the collected guide to the art, thoughts and life of Reg Mombassa - artist and musician. Using new Spirit Camera technology which allows us to see things which aren't there, we enter his world.